This species is accepted, and its native range is Eritrea to Botswana, Arabian Peninsula, Indian Subcontinent to Indo-China. Tufted, pilose annual with culms 10–40 cm. high. Leaf laminae 6–14 cm. long, narrowly lanceolate, acute. 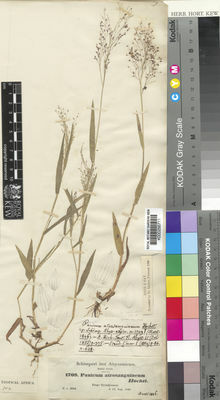 Panicle 4–20 cm. long, ovate or oblong, much branched, the branches fine and spreading or ascending. Spikelets 1.8–2 mm. long, ovate oblong, glabrous, purple tinged; inferior glume broadly ovate 2/3 the length of the spikelet, 3–5-nerved, acuminate; superior glume ovate, 5–7-nerved, acuminate; inferior lemma similar to the superior glume, sterile, its palea poorly developed; superior lemma and palea dark, glossy. Annual; caespitose. Culms 10-40 cm long. Leaf-sheaths hispid. Ligule a ciliolate membrane. Leaf-blades lanceolate; parallel-sided; 6-14 cm long; 5-14 mm wide. Leaf-blade surface hispid, or pilose; with tubercle-based hairs. Leaf-blade apex acute. Inflorescence a panicle. Panicle open; oblong, or ovate; 6-20 cm long. Primary panicle branches spreading. Panicle branches capillary. Spikelets solitary. Fertile spikelets pedicelled. Spikelets comprising 1 basal sterile florets; 1 fertile florets; without rhachilla extension. Spikelets ovate; dorsally compressed; acuminate; 1.8-2.2 mm long; falling entire. Glumes similar; reaching apex of florets; thinner than fertile lemma. Lower glume ovate; 0.66 length of spikelet; membranous; without keels; 3-5 -veined. Lower glume apex acuminate. Upper glume ovate; 1 length of spikelet; membranous; without keels; 5-7 -veined. Upper glume apex acute. Basal sterile florets barren; without significant palea. Lemma of lower sterile floret similar to upper glume; ovate; 1 length of spikelet; membranous; 5-7 -veined; acute. Fertile lemma oblong; dorsally compressed; 1.5-2 mm long; indurate; dark brown to black; shiny; without keel. Lemma margins involute. Lemma apex obtuse. Palea involute; indurate. Africa: west-central tropical, northeast tropical, east tropical, southern tropical, and south. Asia-temperate: Arabia. Asia-tropical: India and Indo-China. Tufted annual; culms 10–40 cm. high, ascending. Leaf-sheaths hispid; blades lanceolate, 6–14 cm. long, 5–14 mm. wide, straight at the base, pilose or hispid with tubercle-based hairs, acute. Panicle ovate or oblong, 6–20 cm. long, much branched, the branches fine, spreading and symmetrical. Spikelets ovate-oblong, 1.8–2.2 mm. long, glabrous, often tinged purple, shortly acuminate; lower glume broadly ovate, 2/3 the length of the spikelet, 3–5-nerved, acuminate; upper glume ovate, 5–7-nerved, acute; lower lemma ovate, 5–7-nerved, sterile, its palea poorly developed; upper lemma dark and glossy. Disturbed places and old farmland in deciduous bushland; 100–2200 m.
Panicum fatuum Fig. & De Not. D.M. Napper, Grasses of Tanganyika: 62 (1965). F. W. Andr., The Flowering Plants of the Sudan 3: 502 (1956). Robyns, Flore des Spermatophytes du Parc National Albert 3: 104 (1955). Eggeling, Ann. list grasses Ug. : 30 (1947). Robyns, Fl. Agrost. Congo Belge 2: 201 (1934). Hubbard, E.A. Pasture Plants 2: 24 (1927). 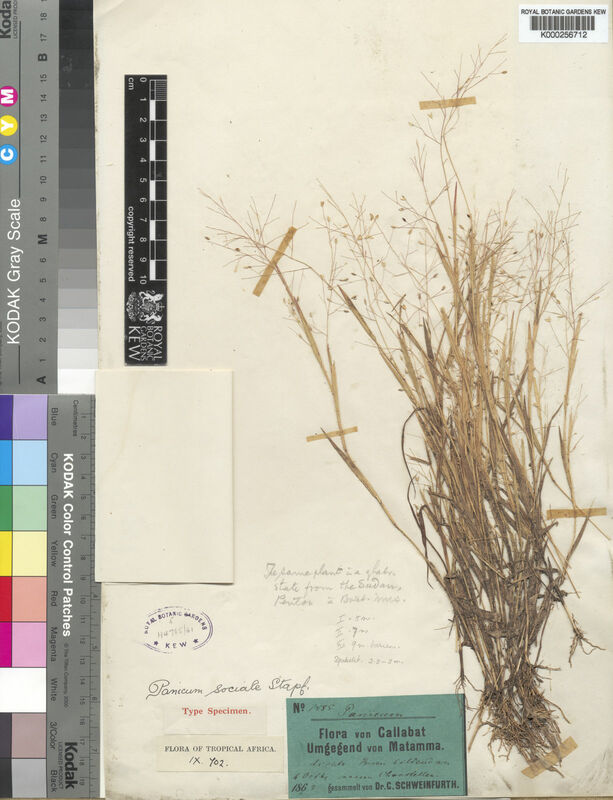 Stapf in Flora of Tropical Africa 9: 703 (1920). A. Rich., Tent. Fl. Abyss. 2: 375 (1851).